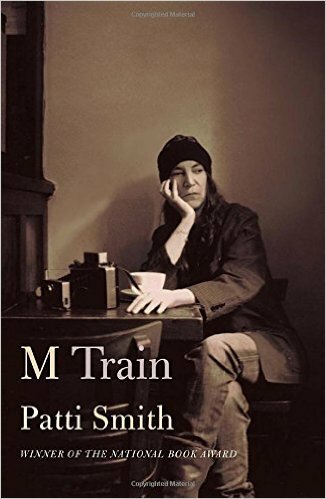 Asked to locate M Train with reference to genre, students of literature would, overwhelmingly, place Patti Smith’s latest romp through her sometime outrageous, but always entertaining pilgrimages—both geographical and mental—if not squarely in the middle of memoir, at least inside its borders. Although her stories chronicle trips to destinations as divergent as New York, French Guiana, Glasgow, and Mexico, the work is written with the attention and care that a poet pays to language, often bringing words themselves to the forefront, and turning them loose like the dogs of Alicia Ostriker’s poem, “The Dogs at Live Oak Beach in Santa Cruz,” to cross the moving surf between prose and poetry, jumping from the sand of narrative into the foaming waters of lyricism, and then “…bound[ing] back to their owners / Shining wet, with passionate speed / For nothing, / For absolutely nothing but joy.” Thus, many readers will experience M Train, if not as prose poetry, at least as poetic prose. model that Lyndon Johnson used to wear. It would be more accurate to say that Smith writes from nothing, seemingly beginning the book, indeed, each chapter, with no thought in mind as to where it might end, and yet still managing to fill pages with memorable images and characters that prove to be worthy traveling companions. Presented as a series of riffs on life and loss that we learn quite late in the book have been assembled from scribbled-on scraps of paper, Smith’s text is more palpable than much writing that is carefully planned from beginning to end. In addition, Smith’s superb Polaroid photographs, appropriately placed throughout, add to the collage-like assemblage of genres, and create a more complete and enduring work of art. I stood in front of the fence on tiptoe and peered through the broken slat. All kinds of indistinct memories collided. Vacant lots skinned knees train yards mystical hobos forbidden yet wondrous dwellings of mythical junkyard angels. I had lately been seduced by a piece of abandoned property described in the pages of a book, but this was real. The For Sale by Owner sign seemed to radiate like the electric sign Steppenwolf comes across while on a solitary night walk: Magic Theater. Entrance Not for Everybody. For Madmen Only! Somehow the signs seemed equivalent. I scribbled the seller’s phone number on a scrap of paper and walked across the road to Zak’s café and got a large black coffee. I sat on a bench on the boardwalk for a long time, looking out at the sea. A few days later the seller’s daughter-in-law, a good-natured young woman with two small boys, met me in front of the old blockade fence. We could not enter through the gate, as the owner padlocked it as a safety precaution. Klaus had given me all the information I needed. Because of its condition and some tax liens it was not a bank-friendly property, so the buyer would be obliged to produce cash. Other prospective buyers, seeking a bargain, had grossly underbid. We discussed a fair amount. I told her I would need three months to raise the money, and after some discussion with the owner, all agreed. —I’m working all summer. When I come back in September I will have the sum I need. I suppose we will have to trust one another, I said. We shook hands. She removed the For Sale by Owner sign and waved good-bye. Although I was unable to see inside the house I had no doubt that I had made the right decision. Whatever I found to be good I would preserve, and transform what was not. —I already love you, I told the house. The arcs had joined, forming a circle. A wagon wheel of words, with spokes wound from strips of sun and desert, a poet’s arrow, trails of the wind-up bird, stepping stones from St. Laurent prison to the grave of Genet, and a redeeming dream of Fred. So many moments relived, scrawled in notebooks and on paper napkins punctuated by quantities of black coffee. There was something so appealing about writing directly to the projected reader, it was hard to let it all go, and like an actor haunted by the wisp of a cast-off character, I found myself unable to completely break from the world of its continuum. I went into the back room but the coffeemaker, beans, wooden spoons, and earthenware mugs were all gone. Even the empty mescal bottles were gone. There were no ashtrays and no sign of my philosophic cowpoke. I sensed he had been heading this way and most likely, spotting the spanking-new paint job, just kept on going. I looked around. Nothing to hold me here, either, not even the dried carcass of a dead bee. I figured if I hustled I might spot the clouds of dust left behind where his old Ford flatbed passed. Maybe I could catch up with him and hitch myself a ride. We could travel the desert together, no agent required. —I love you, I whispered to all, to none. —Love not lightly, I heard him say. Who is to say whether in this passage Smith is back in her dream reminiscing about another coffee house closed down, or actually standing in a coffee house speaking metaphorically, using imagery from her dream world, to mourn another kind of loss before moving on. The beauty of Smith’s work is that it doesn’t matter. It doesn’t matter in the same way that whether we read it as poetry that allows chance to determine line breaks, or whether as prose that heightens its language with sound work like “me/be,” “hustled/dust left,” and “ride/required,” we reach the same destination in the end: a place where we “whisper” to a universe that contains both every thing and no thing; and, like Smith, we receive whatever answer that we need to hear. 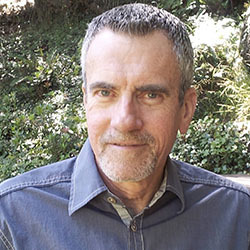 Terry Lucas is the author of two prize-winning poetry chapbooks: If They Have Ears to Hear (winner of the 2012 Copperdome Chapbook Award from Southeast Missouri State University Press), and Altar Call (published in Diesel, the anthology of the 2013 San Gabriel Valley Literary Festival). His two full-length collections are In This Room (CW Books, 2016), and Dharma Rain, just released this October by Saint Julian Press. Terry is a guest lecturer in the Dominican University of California low-residency MFA Program, the Co-Executive Editor of Trio House Press, and a free-lance poetry consultant at www.terrylucas.com.